The modern eingeichtete bedroom, with its spacious wardrobe (+ integrated safety deposit box) and convenience in a stylish device. A sofa bed for two in the living room. Modern furnished apartment with terrace, which shines through its stylish elegance of the furnishings. International TV, Internet optional. Sports facilities. It is located only 190 meters from the beach, supermarket and the beach promenade. On arrival room not ready and got asked to go shop for are own toilet rolls , walked in apartment 2 seater settee covered in stains and a throw that didn’t fit was threw over , dirty marks on walls everywhere , bathroom , had to bleach bath to even stand in it it’s that old and damp all round bath and tiles , got left 2 towels for 2 people for a week that smelled so had to wash first , bedroom , damp coming dwn walls , mattress that old nearly flat , there was a quilt cover as a sheet the pillows stank and was mis matched bedding ( very old bedding and smelly ) my husband found a big square pillow in cupboard but it stank of urine , the whole apartment needs repainting , regrouting , new furniture ,bed and bedding and a good clean every light switch was dirty , the complex is beautiful and spotless , very quiet but lovely , we had to move out of apartment after 2 nights because the smell was that bad will definitely not recommend this property to anyone !!! We weren't sent any checking in instructions just a code to access the resort for which we had no name. All we knew was where it was pinpointed on Google maps. After spending an hour driving around trying to find the place we eventually gave up and contacted ownersdirect for help. They informed us of the name of the resort and then put us in contact with the owner. When we spoke with the owner she told us that owners direct had the wrong information and that we were staying in a different resort. However the room was not ready and therefore we couldn't check in. The owner then moved us to a different resort where we were finally able to check in. The standard of the accommodation which was meant to be an upgrade on where we were supposed to stay was nothing more than average. It was ok value for the money we had paid. However it was very poorly equipped so we just ate out during our stay. Overall this accommodation is ok. I wouldn't stay there again and I'd recommend that the owner addresses some of the communication issues we experienced. Talking with her on the telephone was extremely frustrating. We were looking for an apartment at short notice and spotted this one. The owner responded quickly by e-mail and we also arranged a airport pick up which cost the same as a taxi. I was a bit nervous that no-one would be waiting at the airport but it was all fine. The apartment is in the Los Pocillos area of Peurto del Carmen and only 10 minute journey from the airport. Ana was waiting for us when we arrived and hadn't quite finished getting the apartment ready so we went off for a drink. She very kindly let us put our luggage in her car. There are bars, restaurants and shops a 5 minute walk from the apartment. When we arrived back the apartment was spotless and Ana had also brought our luggage up. The apartment is small but well equipped. It has a hairdryer, iron, telly, kettle and a safe in the bedroom. And a double bed! No pushing 2 singles together. We spoke to other couples staying at different apartments and they had to pay extra for a kettle, use of the TV etc so this was good value. The TV only has German and Spanish TV stations but we did find an English speaking one and a few English radio stations. But then who watches TV when they are on holiday. We didn't try the wi-fi as another review said it wasn't a good connection but you can access free wi-fi in some of the local bars. There is a Spar shop a few minutes walk away and further along the promenade there are more bars, restaurants and tobacco and liquor shops. If you turn right at the bottom of the hill and walk along there are more bars, shops etc about a 10 minutes away. There is a pool at the apartment but it was a bit on the cold side due to the time of year and the weather. There was a bit of noise carried through from the apartment next door but then they were very noisy ie sounded like they were building or moving furniture at 11 o'clock at night! However we have spoken to others staying in different apartments and they had the same noise issue so it's not uncommon. Ana came back to check everything before we left and there was a mix up with our transfer to the airport (my fault I think for not booking it through the owner) but she very kindly offered to take us. Although Ana doesn't speak much English she was very helpful and we must say a big thanks to her. We would definitely go back here maybe slightly later in the year when it's a bit warmer - so we can try the pool! Wahrscheinlich reichen die Zeichen nicht, unsere Kritik auszuführen. Also das Appartement ist in einem sehr abgewohnten, grenzwertigen Zustand, vor allem das Bad. In mehreren Lampen fehlten die Glühbirnen, Von den angeblich 42 m² Wohnfläche gab es nur ca. 25 m²plus ca. 8 m² Terrasse, der Wohnraum hat gerade mal ca. 9 m². Aus dem Poolblick wurde Straßenblick - allerdings wenig befahrene Sackgasse. Internet gab es trotz vorheriger Anfrage keines. Dazu kamen 14 Tage Baulärm durch Sanierungen nebenan. Tagsüber war ein Aufenthalt im Appartement schlicht unerträglich. Der große Fernseher stellte sich als kleiner Flatscreen heraus, auf dem wir trotz aller Versuche und Umschaltanweisung keine deutschen Programme erhalten haben. Die Austattung der Küche mit Geschirr etc. ist sehr zusammengesucht und unvollständig. Alle Reklamationen wurden als unwahr zurückgewiesen - so etwas - aber vor allem die massive Flächenabweichung - grenzt an Betrug. Ein Stern nur weil eine Bewertung ohne Stern nicht möglich ist, der ist aber hierfür schon einer zuviel. 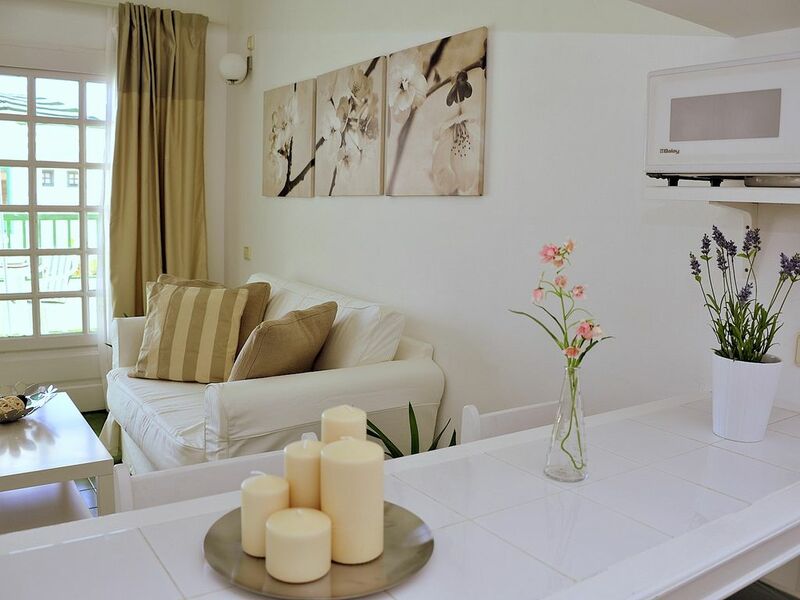 Above the tourist center of Puerto del Carmen is the beautifully elegant apartment. In just 4 minutes on foot you can walk to the 'Avenida de las Playas' seafront promenade and 'Playa de los Pocillos' beach with sun loungers and parasols for hire. A Fahradvereih is also in the immediate vicinity, as well as the 2nd beach promenade, which leads from Puerto del Carmen to Arreicife and several athletes and walkers invites you to romantic evenings directly on the Uferprommenade. Puerto del Carmen has two more beaches: 'Playa Grande' with several water attractions, sun loungers and parasols for hire or the divers paradise 'Playa Chica'. A 4-minute walk will take you to the supermarket and numerous bars and restaurants. In Puerto del Carmen is also a large, modern shopping center 'Biosphere' with more than 50 shops, several restaurants and bars and leisure facilities for children. The apartment is located just 100 meters from the nearest supermarket and the nearest bus stop. In the old town, the harbor of Puerto del Carmen you will find exclusive fish restaurants and typical Canarian food and idyllic cafes with sea views. In the city center is Discomeile for night owls with several bars, restaurants and discotheques. In the small complex is also a wonderful pool to relax. Many sports activities such. B. Cycling, surfing, windsurfing, diving, snorkeling, tennis, hiking, golf, etc. You can carry out on the island. The property has a unique volcanic landscape of Lanzarote with many interesting things to do. Die oben angegebenen Preise sind für 1-3 Personen. KEINE! WEITEREN NEBENKOSTEN ! STROM, WASSER, STEUERN INKLUSIVE! WIFI (10 Euro pro Woche),Flughafenabholung mgl. Babybettchen und Kinderstuhl sind gratis . Bettwäsche und Handtücher werden wöchentlich getauscht und sind sowie die Endreinigung gratis. Zum Reservieren 30 % des Preises überwiesen werden.